"Impressed that your installers showed up on time and when..."
"Great crew, good communications and minimum disruption to..."
For a FREE no-obligation estimate in Summerville, SC, please fill out the form to the right and Carolina Energy Conservation will contact you shortly. Interested in my options to get more light in my home. Our home is going on being 2 tears old. Last year our water lines froze in the master bedroom bathroom a few times. Especially when we had that very cold spell visit us with some snow fall. We would like for someone to come and inspect what we have and recommend a possible solution (free consultation). I noticed in the attic that there wasn't much insulation when I went up there this weekend. Wondering if the builder cut us short on insulating properly and up to code. Concerned that our home is not very energy efficient. Insulation may not be adequate. Upstairs does not stay cool and energy bill can be high. We've been renovating our house and have disturbed or removed a lot of insulation. The insulation is also 50 years old. We'd like to have it removed and spray foam installed. We specialize in a variety of services aimed to lessen your home's carbon footprint and save energy and money each month! We offer it all, from air sealing to ductwork to insulation and HVAC services in Summerville, SC. For a FREE, no-obligation services estimate in Summerville, SC, you'll also receive a free copy of "Saving Energy and Money at Home," a great book to use as you begin to create a more comfortable, healthy, and energy efficient home! This is the new insulation that was blown into the attic. Brenda was concerned about low hanging insulation and possible mold in her crawl space making for uncomfortable floors and high energy bills. 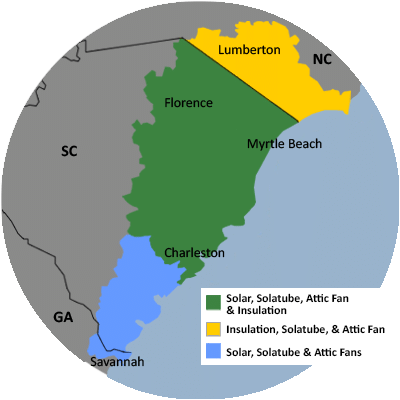 In hopes of finding an affordable solution to this problem, she searched the web for crawl space repair in Summerville and found Carolina Energy Conservation. After giving them a call, Bill Gallagher went out to the home to inspect and evaluate the needs of the crawl space. Bill then sent Joe Ellis and his crew out to the home to replace all of the insulation in the crawlspace. Joe and his crew also laid a vapor barrier in the crawl space to help eradicate mold and prevent moisture from invading the space. Brenda is now very happy with her crawl space and has not had any issues with the insulation since. With a properly insulated crawl space, she will start to see lower energy bills! My garage was "finished" when it was built but it seems the outside wall and ceiling have no insulation as the second floor room above it gets very warm in the summer. I a looking at the possibility of having those areas insulated with blown-in foam in order to save from ripping out the drywall and redoing. Would like to get a quote for solatube install. I need quote for insulation in finished 2.5 car garage.